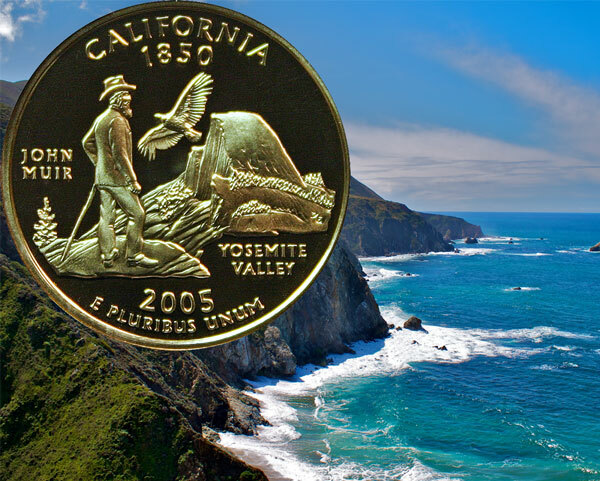 On the 164th anniversary of her statehood, the 2005 California Quarter talks today. Still another idea, though thought to be too far-fetched, claimed the name came from the 11th century Songs of Roland. The poem described Charlemagne’s loss to the Muslim army in August 778. One scholar proposed the name meant “hot oven” from the Catalan words “calc” for lime (lime kiln) and forn for oven. A seemingly logical idea claimed the indigenous phrase “kali forno” meaning “high mountains” influenced the name. However, the Spanish applied the name to maps before the early explorers learned from the Native Americans. At least as early as 1533, the Spanish explorers named the area California. In 1562, the Spanish printed the first map of the area that used the name California. Was it a land of Amazonian women, Caliphs, hot ovens, high mountains or none of the above? 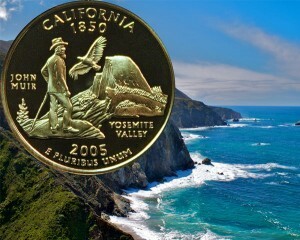 The 2005 California quarter represented the wilderness beauty found by John Muir not the mythical land of Montalvo.